With Barcelona coasting in the latter stages of their win over Inter, Sergio Busquets decided to turn on the style with a wonderful passage of play. The Catalan giants were leading by two goals at the Nou Camp in their Champions League clash on Wednesday night, courtesy of efforts from Rafinha and Jordi Alba. 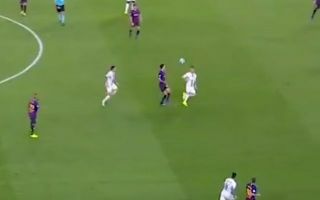 Given their commanding lead, it arguably played a part in Busquets feeling a little more comfortable in showing off his skills as he got himself out of tight spot with some excellent control and flair, as seen in the video below. Not content with lifting the ball over one Inter player, he did so again immediately after and as he played the ball on, his efforts were appreciated by the home faithful as it earned him an ovation. The 30-year-old has played a fundamental part in Barcelona’s success for years now, and his composure, technical quality and defensive ability in that crucial role in front of the backline continues to ensure that he will remain a key figure in their continued pursuit of success in the coming years.